It is the dawning of a new day. A day in which your mind is rested and at peace. You awaken energized and ready for anything. In this book, the author's simple tricks and exercises that will allow you to quiet your mind, reduce stress and think clearly. You will access mental flexibility and deep inner peace while reading through this fast fun book, guaranteed to lighten your day! 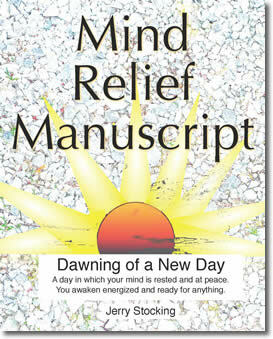 Reading the Mind Relief Manuscript is guaranteed to quiet your internal dialog and reduce stress. Whether you are looking to relieve yourself from information overload or cultivate new habits based on mindfulness and peace, the Mind Relief Manuscript is guaranteed to transform your life. The book summarizes the best techniques and exercises from the workshops of Jerry Stocking, who has been at the leading edge of self improvement and actualization for the last 30 years. Having taught and trained thousands of people in workshops, Jerry has created a collection of the most powerful tools he has used over the years. Tools that will change your life from stress and anxiety to deep inner peace. Today more than ever, we are bombarded with stimuli and information and many of us experience an overload of our minds and senses. We lose touch with the inner stillness and peace that reside deep inside of us. These natural gifts are waiting, dormant, and ready to be released. For the first time ever, enlightenment principles are being applied to enhancing these gifts in your daily life. Enjoy bliss at work and at home by simply practicing the exercises contained in this book.